"Springtime means being outside. It means being able to play hopscotch, and sing songs, and play with bolo-bats. Comptines is about little girls celebrating spring in Montréal. They play in alley-ways, in doorways, in parks and on the street. They sing songs that were sung by their parents, and maybe their grandparents. Gibberish rhymes, counting songs, and old folksongs ring out in children's voices. 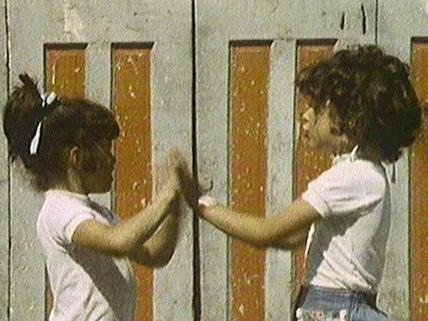 Without commentary, this short sketch travels the by-ways of Montréal where little girls play. Comptines is a French word for children's song games." National Film Board of Canada. "NFB -- Comptines." National Film Board of Canada. http://www.onf-nfb.gc.ca/eng/collection/film/?id=13190.